There were again two series in 1974, one backed by John Player and the other by Southern Organs. The John Player series fell to John Nicholson and the Lyncar for the second season but it was a close-run thing with five other drivers winning two or more rounds. The ten-round Southern Organs series was won in dramatic fashion by Jim Crawford, the find of the season, but only after his luck swung in the closing races. His fine performances in his friend Steve Choularton's second March 73B had led to a testing contract with the Lotus F1 team, but Choularton was having to fund both cars from his own pocket, and when Crawford wrecked his car at Brands Hatch at the end of September, Choularton could not afford to go on. Fred Opert came to Crawford's rescue with the offer of a Chevron B27, and he battled with series-leader Alan Jones (in Harry Stiller's March 74B) at the penultimate round, snatching the win after Jones had a puncture on the last lap. More drama followed at the double-points final round, where Jones again led, and Crawford again caught him - this time Jones' gear-linkage failed in the closing moments, and Crawford sped past to take the win and the title. Of the leading contenders, Jones would become World Champion and Crawford, Nicholson and fellow race-winners Tony Brise and David Morgan would all make it into F1 within a year. March was again the dominant marque with the March 74B and 73B each accounting for nearly a quarter of the grid. The Lyncar was the next most successful in terms of points scored followed by the Brabham BT40, Chevron B25, Modus M1, Chevron B27 and the Scott. A remarkable 21 constructors started at least one race during 1974. This series ran over 14 races using a 20-15-12 points system. Nicholson only got two wins and two second places but the points system narrowly favoured his consistent top-six finishing over the two wins, three seconds and four retirements of Crawford; the three wins and four non-starts of Brise; or the three wins and poor attendance record of Jones. Richard Scott also won two races at the start of the season in his Scott F2. Points table from the John Player Motorsport Yearbook 1975 p297. This 'club racing' series used a 9-6-4 system with double points awarded at the last round. The points table used here is constructed from race results. 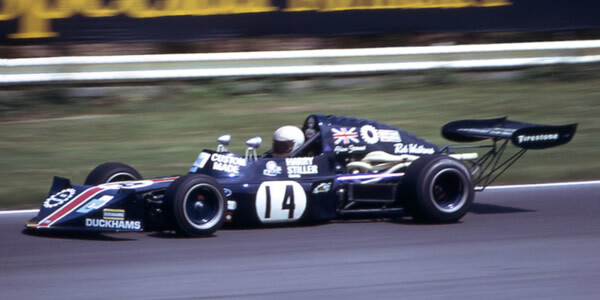 Two non-championship races were won by Morgan and Steve Choularton (March 73B). The results here have been compiled by Chris Townsend using Autosport and Motoring News. Not all the results are complete; results sheets or details of non-starters are needed for Brands Hatch 18 Mar 1974, Oulton Park 27 Apr 1974, Oulton Park 5 May 1974, Silverstone 12 May 1974, Silverstone 30 Jun 1974, Brands Hatch 20 Jul 1974, Mallory Park 11 Aug 1974, Phoenix Park 7 Sep 1974, Mondello Park 15 Sep 1974, Mallory Park 13 Oct 1974, Brands Hatch 19 Oct 1974, Snetterton 27 Oct 1974, Brands Hatch 3 Nov 1974 and Thruxton 16 Nov 1974. The only entry lists still needed are for Phoenix Park 7 Sep 1974 and Mondello Park 15 Sep 1974. Grid sheets or details of qualifying are needed for most races: Brands Hatch 18 Mar 1974, Silverstone 7 Apr 1974, Snetterton 14 Apr 1974, Oulton Park 5 May 1974, Silverstone 12 May 1974, Mallory Park 23 Jun 1974, Silverstone 30 Jun 1974, Thruxton 7 Jul 1974, Brands Hatch 20 Jul 1974, Silverstone 28 Jul 1974, Mallory Park 11 Aug 1974, Phoenix Park 7 Sep 1974, Mondello Park 15 Sep 1974, Mallory Park 13 Oct 1974, Brands Hatch 20 Oct 1974, Snetterton 27 Oct 1974, Brands Hatch 3 Nov 1974 and Thruxton 16 Nov 1974. Chassis identification is again largely from chassis plate observations by Adam Ferrington and others. Chevron, Royale, Lola and Modus production information has also been valuable. Any production information on the March 722, 73B and 74B, the Ensigns or the GRDs would be very useful. More details of the DBR, Genie, Huron, MRE and Sovereign would also be greatly appreciated.